I’m going to cut straight to the chase with this page on my website, and start by telling you the main reason spring or “coil” mattresses are still manufactured is because they’re cheap to construct and to buy. The technology used within a spring mattress hasn’t changed that much in many years, and the support you received from a new one bought 10 years ago will be the same if you buy one now. However, I’m not about telling you what’s good for you and what isn’t. My job is to make sure you get both sides of the story and I think this page will be very useful for those of you who are not sure if moving from a spring mattress to memory foam is the right choice for you. So, let’s take a look at some of the pros and cons you can expect with both types. Of course, I will try not to be biased, but I can’t help starting with memory foam. There is far more choice with a memory foam mattress simply because of the abundance of technology available to manufacturers. Plus the levels of firm to soft are far more accurate than that of a coil spring, not to mention the different layers foam mattresses can have. Starting out with a foam mattress before you suffer from back, neck or shoulder pain could stop this from happening all together because you get the natural support you need from the word go! 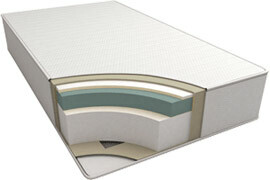 If you do have trouble with various aches and pains whether they’re mild or severe, a foam mattress will definitely help because it supports important pressure points across the body. Unlike a spring mattress, the technology within is like having billions of tiny springs supporting your frame and it will contour to your natural shape much better. Think of it like buying a suit that’s been made for you rather than buying “off the peg”. Foam mattresses will last much longer and the warranties available are more extensive because the materials used are far superior to that of a spring type. Largely, you’ll be doing the environment a favor especially if you look out for the CertiPUR-US certification. One of the biggest complaints about foam mattresses is the fact they produce additional heat. However, there are brands on the market like the DynastyMattress 12-Inch New Cool Breeze GEL I have reviewed that pretty much eliminate this problem. Depending on the way of packaging, you may have to wait for your mattress to expand before you can use it, and in some cases there will be an odor. Finally, yes, foam mattresses will cost you more. But, they last longer if cared for properly and could avoid problems in the future due to aches and pains caused by a poor sleeping surface. First of all, as I have mentioned a spring mattress is cheap. The main reason for this is the technology used to construct them is pretty basic. When you first buy a spring mattress, there is no need to wait until you can use it because they “spring” to their original form instantly. Since spring mattresses don’t rely on heat to adjust to your body, you won’t get the problem of being too warm when you sleep. They are well ventilated. You won’t get the “outgas” odor that’s sometimes synonymous with foam mattresses because of the materials used. If you don’t like the idea of waiting for your mattress to conform to the contours of your body, a spring mattress might be the answer. This is a personal issue though, and most people get used to this characteristic of memory foam fairly quickly (plus new foams and layer set-ups are being developed every day, making the problem slowly go away). Body weight will not be distributed evenly so it’s impossible for a spring mattress to help support various pressure points around the body that can cause spine or joint problems. It’s virtually impossible to find a mattress of this type with anything more than a 10 year warranty due to the materials used and in many cases they will start to sag after a year or two because of the way they’re designed. Maintenance of a spring mattress will take up much more of your time because they not only need to be rotated often, but flipped as well.